Catch the action from Wednesday night’s game at Moda Center in Portland. Chandler Parsons drops a team-high 16 points against the Trail Blazers in Portland. Watch Ivan Rabb fly in high to put it down hard. Watch Bruno Caboclo surprises the crowd by sending them a package courtesy of Enes Kanter. Watch Justin Holiday put the exclamation mark on Tyler Dorsey's snag. Watch as the ball creeps around the rim before finally going in off of Tyler Dorsey's baseline drive up the lane. Watch Yuta Watanabe drive under the basket and finish with a left-handed finger roll. Watch Chandler Parsons nail a long bomb keeping the Grizzlies a perfect 6/6 from beyond the arc thus far. 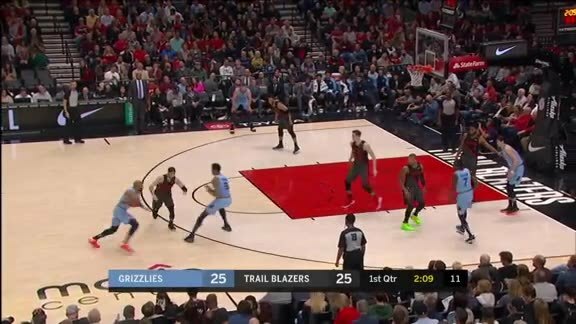 The Trail Blazers scored a season-high 68 points in the paint while holding the Grizzlies to 34 points in the paint. The Trail Blazers went on a 14-2 run over the first 3:05 minutes of play in the third quarter. The Grizzlies would trail for the rest of the game. 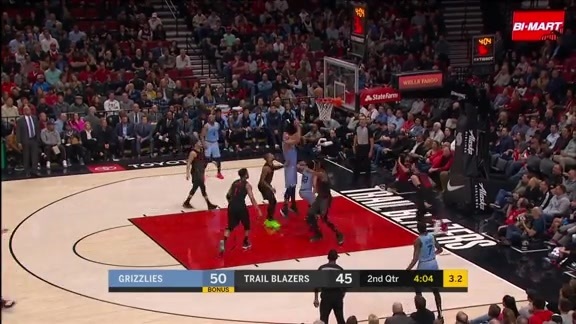 After a closely contested first half, the Portland Trail Blazers outscored the Memphis Grizzlies 50-34 in the second half to win, 116-89, on Wednesday night in the Moda Center. Memphis dropped to 31-47 on the season and 11-28 on the road. Portland improved to 50-28 on the year and are 30-9 at home. The teams split the season series 2-2, with the home team winning each time. 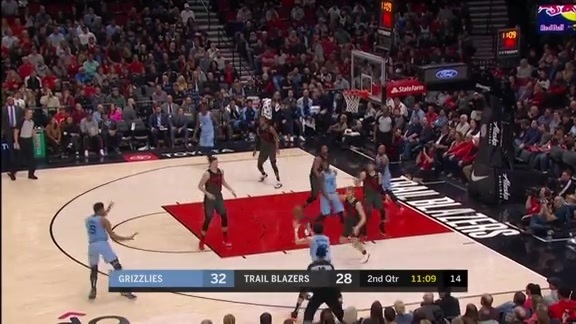 With Jaren Jackson Jr., Joakim Noah and Jonas Valanciunas out for Memphis, Portland capitalized on the size mismatch in the post. The Trail Blazers outscored the Grizzlies 68-34 in the paint, the second-most paint points by a Grizzlies’ opponent this season. 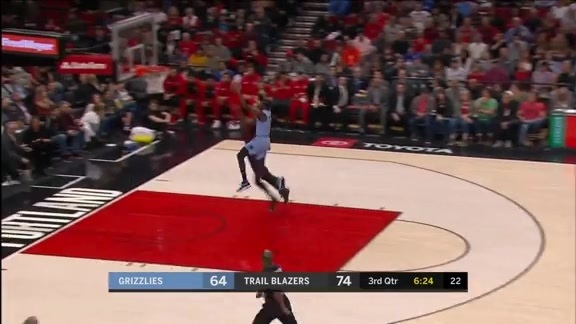 The Trail Blazers also outrebounded the Grizzlies 54-32, including a 14-4 edge on the offensive glass and a 21-8 advantage in second chance points. Chandler Parsons led the Grizzlies with 16 points (3-5 3P). Parsons has scored in double-digits in back-to-back games, having set his season-high (17) against the Clippers on March 31. Ivan Rabb logged his fourth double-double of the season, finishing with 13 points and 10 rebounds. Delon Wright added 11 points and a team-high six assists. Wright is averaging 13.0 points and 6.2 assists over his last five games. Justin Holiday also had 11 points and five boards, while Bruno Caboclo came off the bench to score 11 points and block a game-high three shots. After starting the game shooting a perfect 6-for-6 from three-point range, the Grizzlies shot just 5-for-27 from deep the rest of the way. The Grizzlies shot 31-for-80 (.388) overall, while the Trail Blazers made over half their shots by going 48-for-94 (.511). Memphis won the turnover battle, 14-13, but Portland doubled them up on points off of turnovers (18-9). Seven different Grizzlies recorded a steal in the game as the team finished with 10 total steals. Evan Turner finished with 13 points, 12 rebounds and 11 assists off the bench, giving him his second-straight triple-double. Turner now has five career triple-doubles. Enes Kanter recorded his 30th double-double of the season, finishing with a game-high 21 points and 15 rebounds. Damian Lillard added 20 points 10 assists and seven rebounds, registering his 13th double-double of the year. Lillard now has scored over 2,000 points this season, joining Clyde Drexler as the only Trail Blazers to have multiple 2,000-point seasons with the team. Maurice Harkless chipped in with 11 points and a game-high four steals. Portland picked up where they left off before halftime, kicking off the second half with a 10-2 run to jump out to a 72-61 lead. Memphis went cold in the third quarter, shooting 4-for-19 (2-9 3P) to score 10 points, their fewest in any quarter this season. 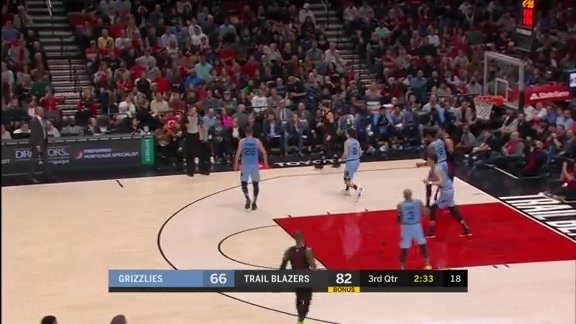 The Trail Blazers continued to muscle their way inside, outscoring the Grizzlies 30-8 in the lane during the second half. The Grizzlies shot well in the first half, going 22-for-41 (.537) from the floor and also 8-for-15 (.533) from three. 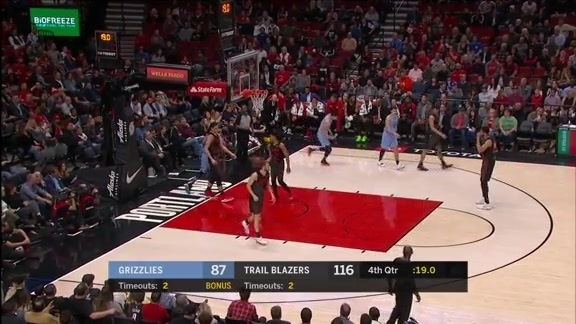 The Trail Blazers did their damage inside, shooting nearly 58 percent from the field despite making 4-of-13 (.308) threes, and outscoring the Grizzlies 38-26 in the paint. Portland already had a double-digit lead in rebounds in the first half, beating Memphis 23-13 on the boards. Memphis was active on defense during the half, forcing nine Portland turnovers while committing four of their own. The Grizzlies were in rhythm from beyond the arc early on, making their first six three-pointers of the game. They would need every one of them, as the Trail Blazers made 10-of-17 (.588) field goals in the first quarter. 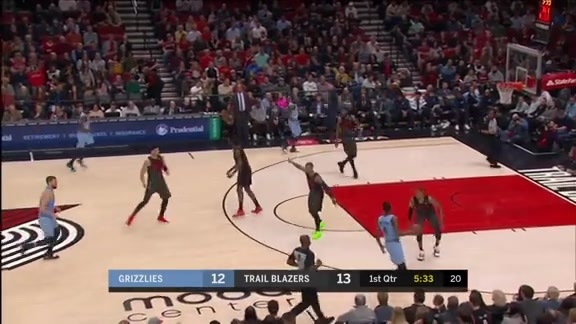 Memphis mixed up defenses in the period, using zones and presses to force Portland into committing six turnovers, but failed to convert any of them into points. The Grizzlies assisted on nine of their 11 baskets in the opening period to help lead 30-28. 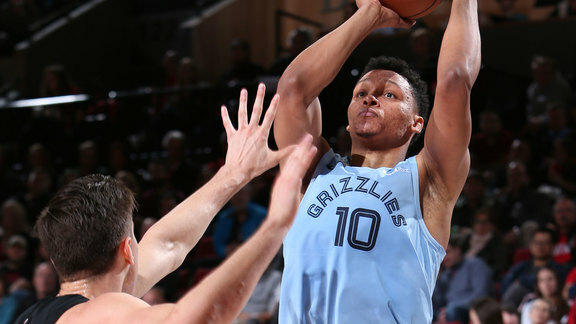 The Grizzlies wrap up the road trip with a contest against the Dallas Mavericks on Friday, April 5 at 7:00 p.m. CT inside American Airlines Center. Tune in to FOX Sports Southeast presented by Pinnacle Financial Partners or listen on 92.9 FM ESPN to follow the action. I thought we slowed [Portland] down a little bit and gave ourselves an opportunity to stay in the game. In the second half, we just couldn’t score enough to get ourselves back in the zone and to get set and be a little disruptive. 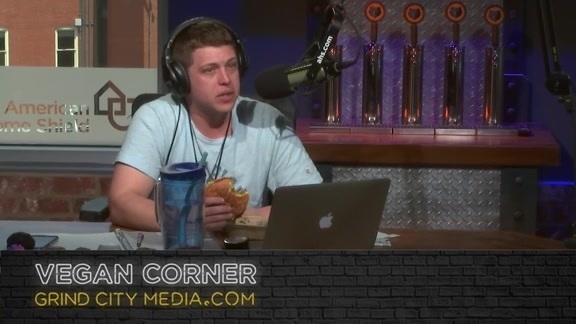 I thought our guys were good in the zone, they were active, and they were communicating with one another and those are the things that you have to do. I thought in the second half, offensively, the game got away from us because we didn’t repeat the same things we were doing in the first half. Give Portland credit, they turned their defense up. We started putting ourselves in positions in small areas and they were able to get deflections and steals and [force] turnovers and there’s no defense for that. You don’t have an opportunity to get back and protect your paint and they took advantage of it. Give them credit, some of it is on us for not doing the same things and simplifying the game like we did in the first half. I feel the love from Oregon every time, so it’s good to be back here…every time I come back here, it feels like home. The Oregon fanbase, the Duck fanbase, and the girls are still in the Final Four, so good luck to them coming up on Friday…I always enjoy myself when I come back here. The zone defense was working in the first half, I think in the second half we were still working defensively but offensively we just couldn’t find the rhythm, making too many turnovers, getting in the paint…Kanter was just rebounding and being a big load down low…we just couldn’t fight back. I think it was just lack of execution, lack of holding on to the ball and making the right plays…too many turnovers that just lead to transition points for them, easy baskets going downhill, they scored in the paint too much…tonight they had 60 or 70 points in the paint, and it’s hard to win a game when you give up that many points in the paint. Chandler Parsons led the Grizzlies with 16 points (3-5 3P). Parsons has scored in double-digits in back-to-back games. Ivan Rabb logged his fourth double-double of the season, finishing with 13 points and 10 rebounds. Delon Wright added 11 points and a team-high six assists. Wright is averaging 13.0 points and 6.2 assists over his last five games. Bruno Caboclo came off the bench to score 11 points and block a game-high three shots. Evan Turner finished with 13 points, 12 rebounds and 11 assists off the bench, giving him his second-straight triple-double. Turner now has five career triple-doubles. Enes Kanter recorded his 30th double-double of the season, finishing with a game-high 21 points and 15 rebounds. Damian Lillard added 20 points 10 assists and seven rebounds, registering his 13th double-double of the year.